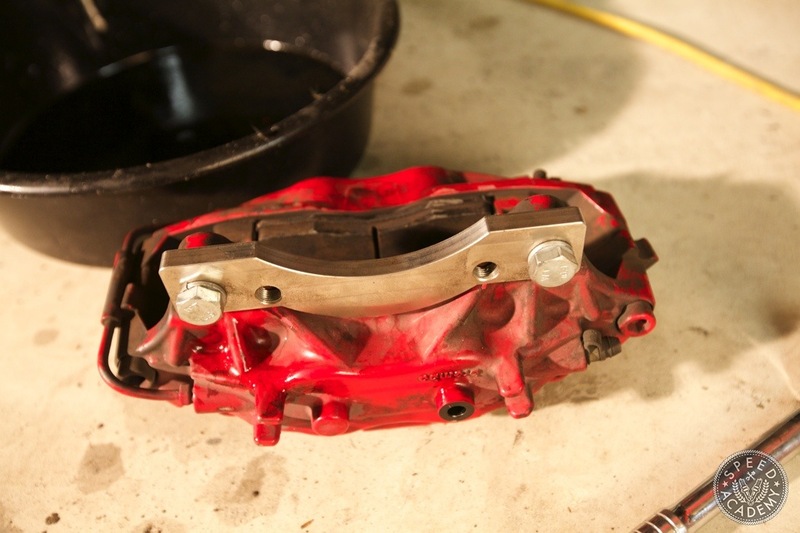 I just recently published a how-to story on doing a 300ZX rear brake conversion on the S14 240SX and here’s the follow up to upgrading the front calipers with Evo Brembo calipers and DBA 2-piece rotors. 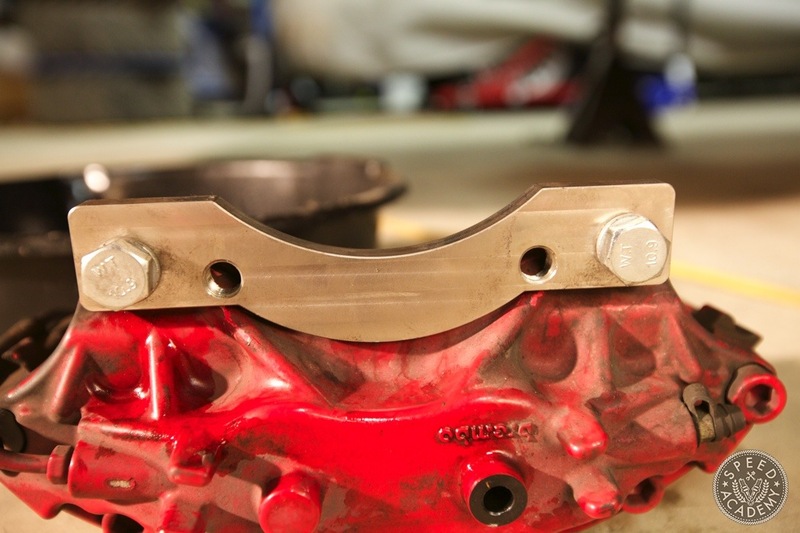 If the Brembo caliper upgrade isn’t within your price range then a more affordable option is the front 300ZX brake setup. 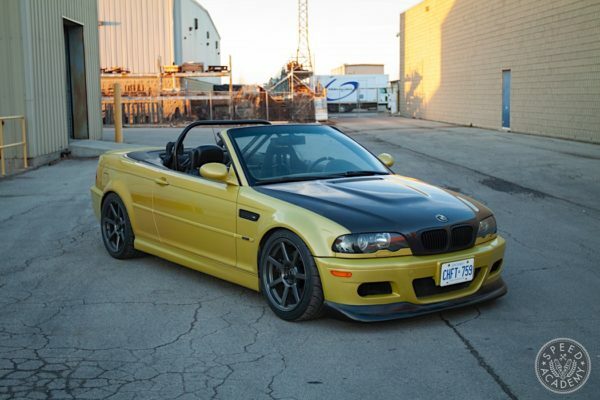 It’s about half the cost of the Evo setup and still uses a decent size 4-piston caliper. 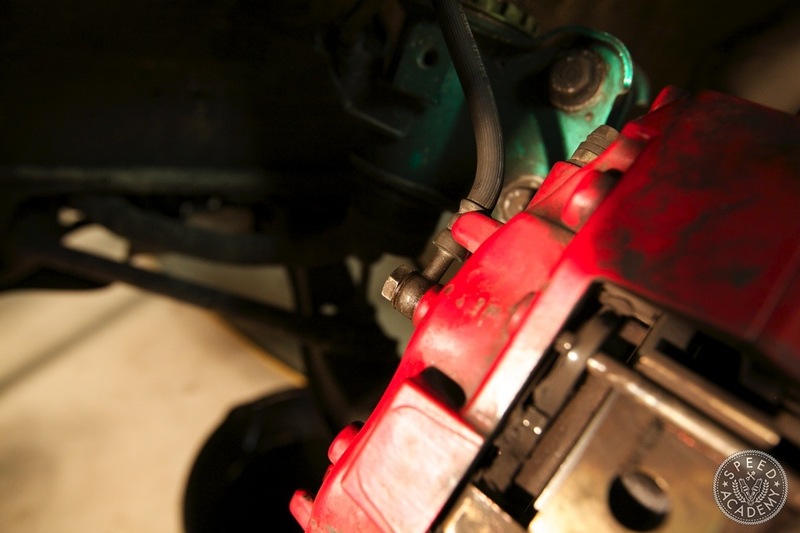 The big advantage to the 300ZX calipers is that they bolt on directly to the 240SX hub with zero modification. The rotor also slides on and BAM! That’s the jist of the install instructions. 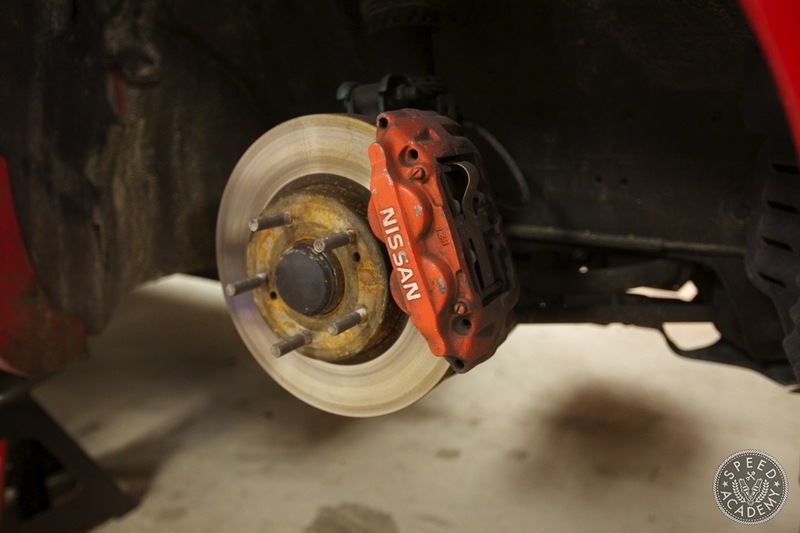 I’ve been running the 300ZX front brakes almost 4 years now and for light track duty it’s a fantastic upgrade over the stock 240sx brakes but the moment you begin to really push the car the rotors and pads can’t keep up and brake fade begins to occur. That’s really the main reason to go with the bigger, better, Evo upgrade, the increased surface area of both the pad and disc should (I haven’t tested this setup out yet) be provide ample stopping power with zero fade. The only downside to the larger brakes and rotors is the extra weight you’ll add but I think the tradeoff is well worth it . 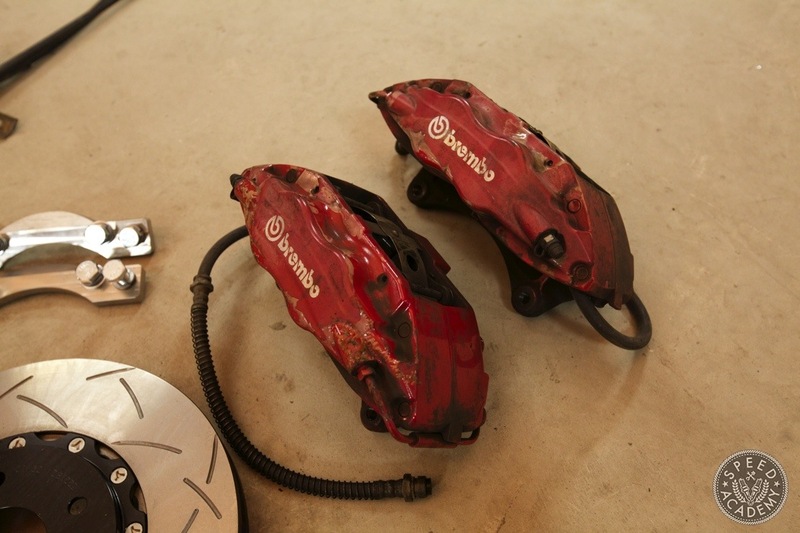 You can purchase used Mitsubishi Evolution Brembo calipers online, prices range from $250.00 that look like mine or can sell for upwards of $400.00 for a mint set. Or as is my case, you have a set that came off your old Evo and consider them a freebie. 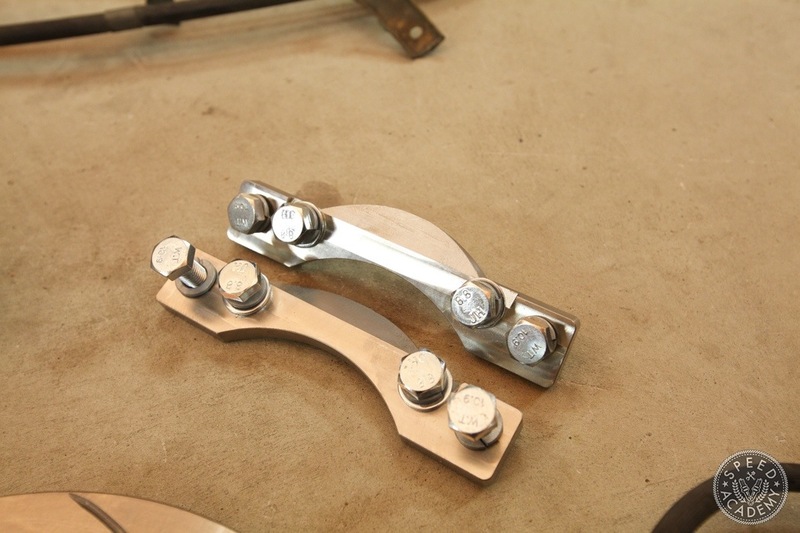 Touge Factory makes brake adapter brackets that allow the Brembo calipers to bolt up to the S14 hub with no modifications needed. After handling and installing these, I can safely say that the heavy duty design and perfect fit gives me reassurance they won’t fail. 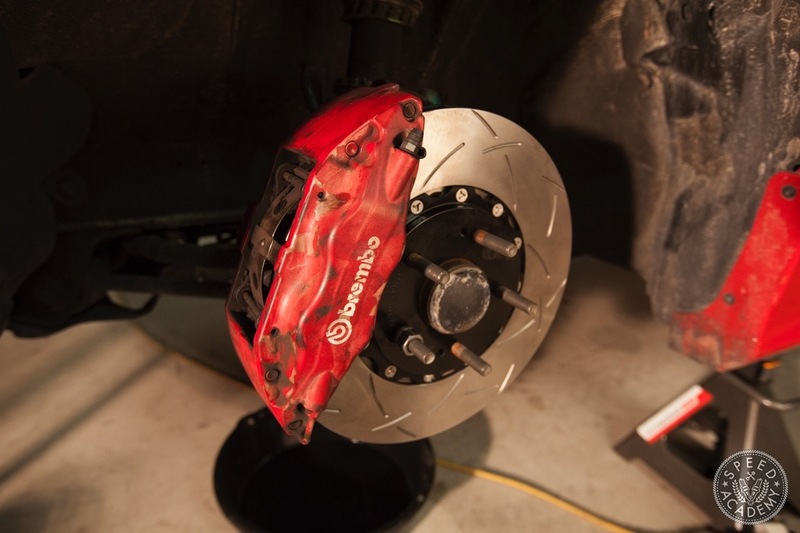 If you’re on a serious budget then using stock Evo rotors will do the trick. 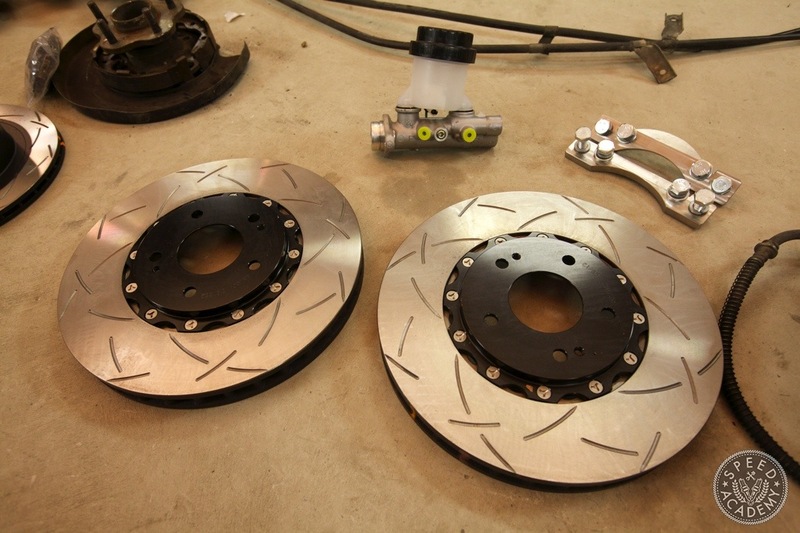 However, for increased stopping power a set of DBA Club Spec 5000 Series T3 2-piece rotors should be on the upgrade list. 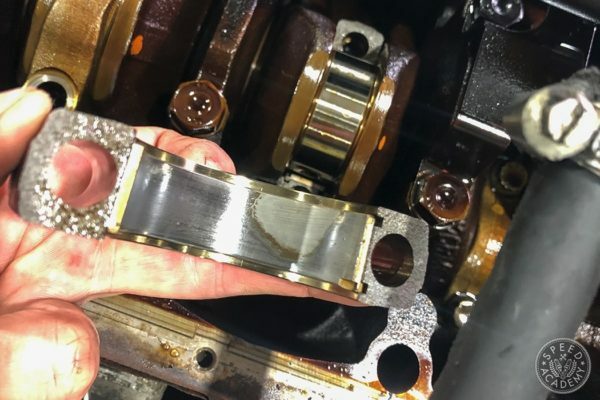 DBA designs their rotors with a high carbon alloyed iron for increased thermal capacity and uses 144 diamond and tear drop vents to increase cooling and reduce disk fatigue. A neat feature that I’ve yet to see on other high performance rotors are paint markings that change colour at specific heat temperature thresholds offering the driver information about the rotors peak braking temperatures. Ideal for anyone looking to tune pad selection for brake temps. Don’t do as I did and install the adapter brackets onto the hub before bolting the caliper on. This method definitely doesn’t work but hey at least you can see how well it fits on the hub. Instead, the bracket mounts to the caliper and then the whole unit slides onto the rotor and gets bolted down to the hub. That’s pretty much all there is to it. Don’t you wish all upgrades were this simple? Life would be grand! 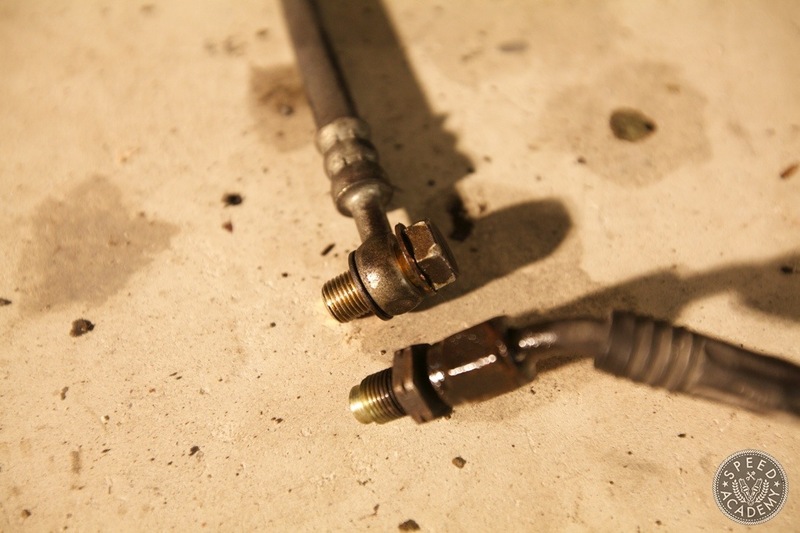 I was hoping I could’ve recycled the 300ZX stainless steel braided brake lines that I had on installed but sadly even though the line screws into the Evo caliper the fitting end is different. Plus, a banjo bolt style fitting is used on the Evo caliper and messing with the design of brake lines is not my cup of tea. The Evo brake line is actually extremely close in length to the stock S14 line so it bolts up to the car with zero issues meaning you can buy Evo stainless steel brake lines and use them in this application. And that’s all she wrote ( or should it be all he wrote? ) 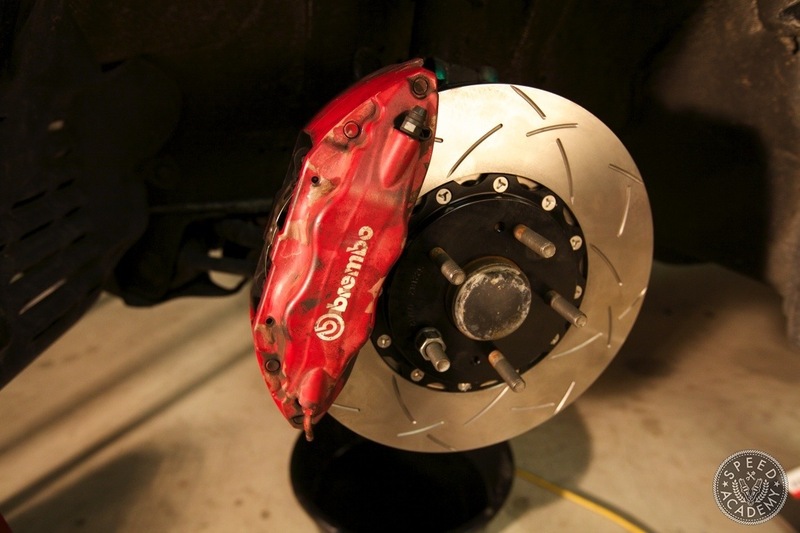 for the Evo Brembo caliper install on the Nissan 240SX. For reference, this setup will bolt to both the S13 and S14 chassis. 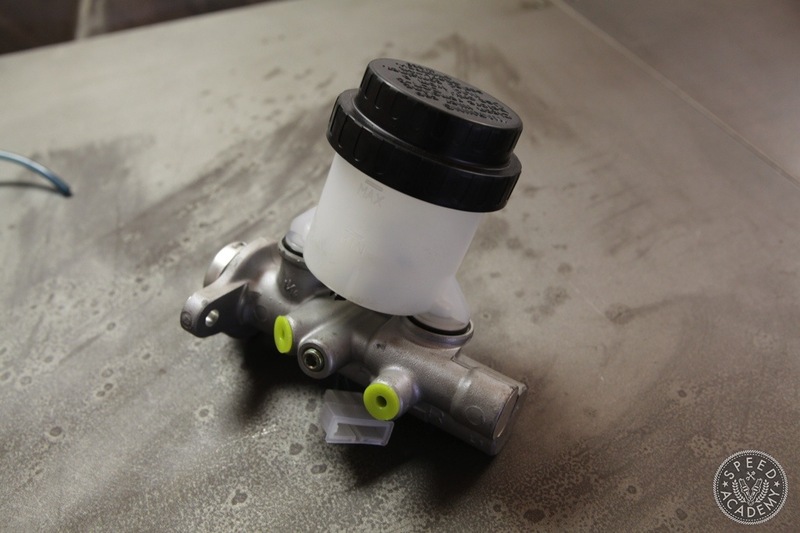 However, there is an optional item that I recommend upgrading when doing this conversion and that’s a larger brake master cylinder. 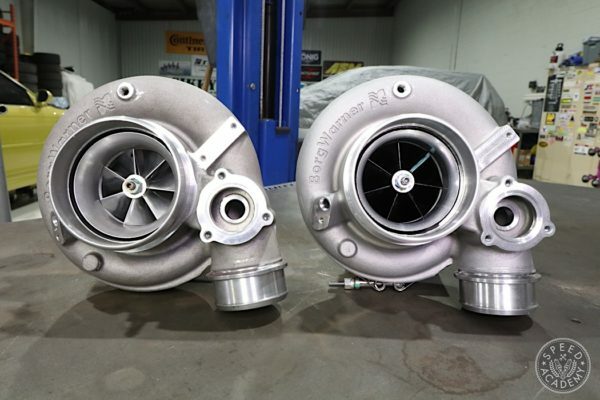 There are two different sizes that work with the 240SX and they’re both out of a 300ZX. 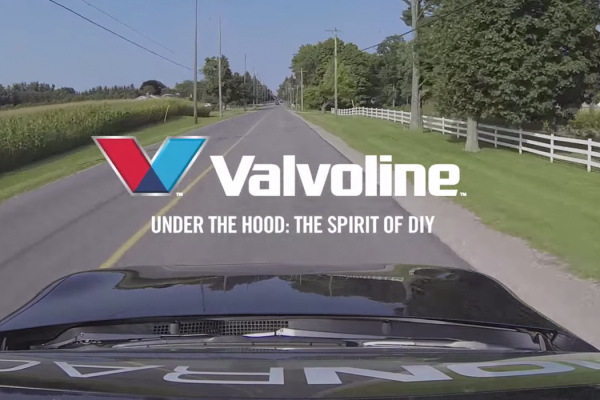 It’s the car that keeps on giving to the 240SX community! I went with the larger 1 1/16-inch diameter but a slightly smaller 1-inch BMC is also available. You’ll have to bend some brake lines if your 240 isn’t equipped with ABS but it’s easier then you think. Just watch the video below and it explains all the details! 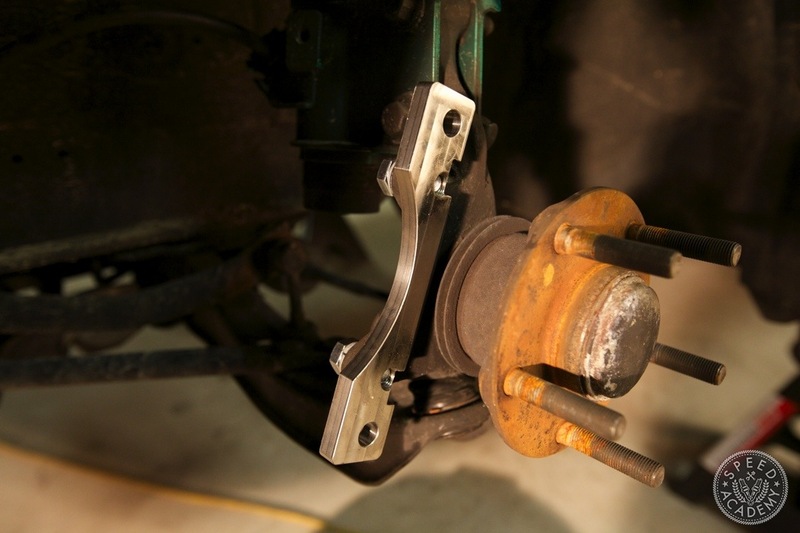 I only want to upgrade the front brakes on my S14, do you think its necessary to upgrade the brake master cylinder as well? If you’re doing the upgrade for mainly cosmetics then you can leave the brake master alone. It will be just fine for the street. It’s on the track where you’ll notice the difference with the upgrade. 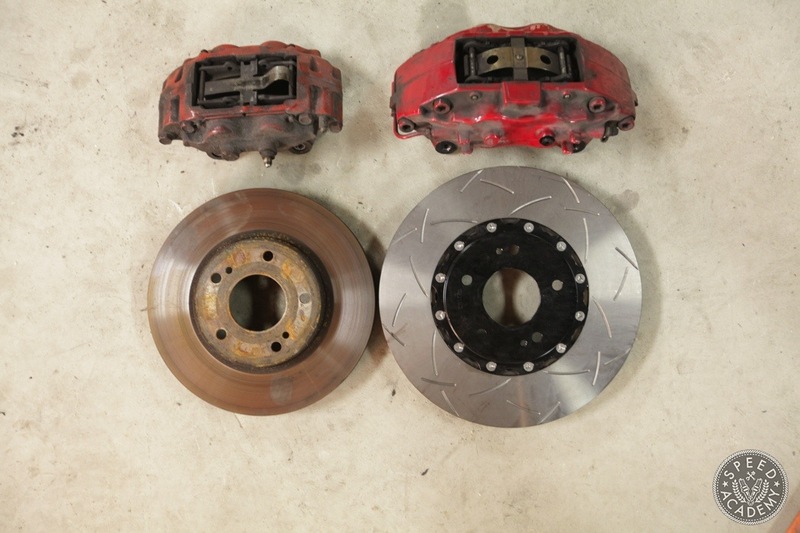 Hello there, I am assembling damaged Audi TTRS with 370mm front discs, regarding we can not find original front Brembo clippers, we decide to use Alfa Romeo 159 Brembo clippers, but we do not have adapters, can you help and provide it? Does this work on the r32 skyline too? 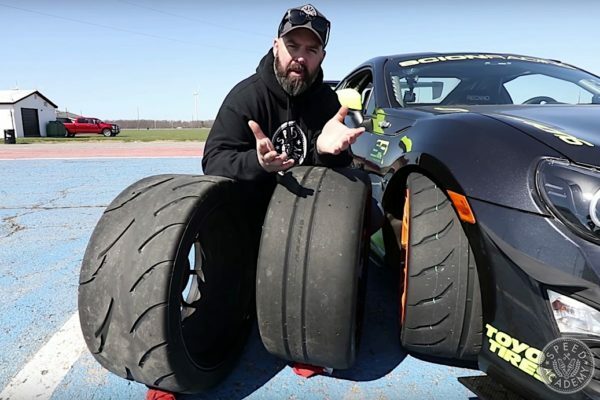 The brakes are same as 300zx, but knuckles are different?